Kindly note that the days and times given below are in PDT (Pacific Daylight Saving Time). For Rocky Mountain Time (except AZ which is on PDT in the summer) add 1 hour. For Central Time, add 2 hours. For Eastern Time, add 3 hours. For Alaskan Time, subtract 1 hour. For Hawaii-Aleutian Time, subtract 2 hours. For Greenwich, add 8 hours. For Central European time (CET) add 9 hours, for Eastern European Time (EET), add 10 hours. RUNE OF THE MONTH: Uruz “support”. From time to time, we all need encouragement and the sense that our backs are covered no matter what. Taking the time to appreciate ourselves and others, offer a positive word, have helpful thoughts and want the best for all, is where a happy society begins. Let us focus this month on random acts of kindness and whatever our circumstances seem, trust in benevolent outcomes. Jupiter remains retrograde this whole month until August 11. Its shadow period extends until November 6th. The degrees covered in June (20º38’–17º03’ Sagittarius) are represented in the Sabian Symbols by: “A child and a dog wearing borrowed glasses”, “In an old-fashioned northern village men cut the ice of a frozen pond for use during the summer”, “Pelicans menaced by the behavior and refuse of men seek after areas for bringing up their young”, “Children playing on the beach, their heads protected by sunbonnets”. It is our integrity that helps us navigate the chaos, illusions, lies and corruption of our environment with dignity and elegance. Even in the midst of illusions and turmoil, there is always a place of inner peace and power from which, like the phoenix from its ashes, we can rise again, stronger than ever before. Saturn remains retrograde this whole month until September 18 between 19º42’ and 17º53’ Capricorn. Its shadow period lasts until December 24. The images associated with these degrees are: “A hidden choir is singing during a religious service”, “A five year old child carrying a bag filled with groceries”, “The union jack flag flies from a British warship”. A month to fulfill our duties and obligations with dignity and courage. The more quietly responsible, disciplined and grounded we are, the more profound our growth will be. 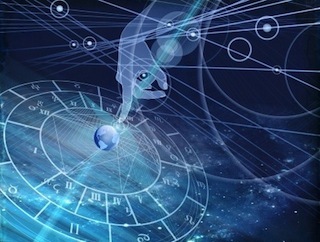 Neptune turns retrograde on June 21st at 18º44’ Pisces, and will remain so until November 27. Its shadow period will last until March 17, 2020. The image representing this degree is: “A master instructing his disciple”. Our attention this month should turn to our inner spiritual growth. As the saying goes: “when the disciple is ready, the master appears”. The opposite is also true. Masters come in all shapes and forms. It could be a child, a pet or a painful event in our lives forcing us to re-examine our motivations and re-direct the course of our actions. As we open to the teachings crossing our path, we start to change in ways defying our own understanding. Pluto remains retrograde this whole month until October 3. Its shadow period continues until January 24, 2020. The degree traveled in June (22º49’ – 22º14’ Capricorn) is symbolized by: “A soldier receiving two awards for bravery in combat”. We are required to face with courage the darkest places within ourselves and not back down in the face of adversity. Our power is being tested, as is our determination. Mastery of self is rewarded. From 6/1 at 3:52 PM till 6/2 at 4:48 AM: when the Moon enters Gemini. On 6/4 between 8:42 AM and 9:17 AM: when the Moon enters Cancer. On 6/6 between 7:10 AM and 12:16 PM: when the Moon enters Leo. On 6/10 between 5:01 AM and 5:29 PM: when the Moon enters Libra. On 6/12 between 8:15 AM and 9:02 PM: when the Moon enters Scorpio. From 6/14 at 12:45 PM till 6/15 at 2:03 AM: when the Moon enters Sagittarius. On 6/17 between 1:31 AM and 9:13 AM: when the Moon enters Capricorn. On 6/19 between 4/19 AM and 7:01 PM: when the Moon enters Aquarius. From 6/21 at 7:02 AM and 6/22 at 7:01 AM: when the Moon enters Pisces. On 6/24 between 4:10 PM and 7:38 PM: when the Moon enters Aries. On 6/27 between 0:51 AM and 6:32 AM: when the Moon enters Taurus. On 6/29 between 11:38 AM and 2:09 PM: when the Moon enters Gemini. Moon in Gemini between Sunday 6/2 at 4:48 AM and Tuesday 6/4 at 9:16 AM + between Saturday 6/29 at 2:09 PM and Monday 6/1 at 6:23 PM: Excellent for multi-tasking, curiosity, any form of communication, exchanging information, sending e-mails, calling friends and acquaintances. Great also for social activities, attending conferences, reading a book, watching a documentary, gathering data on various topics, connecting with new people…. Moon in Cancer between Tuesday 6/4 at 9:17 AM and Thursday 6/6 at 12:15 PM: Perfect for family activities, especially those involving children. Good for spending more time at home, cooking, nurturing ourselves and those we love, inviting the people we cherish over for dinner. Excellent also for drawing, creative writing, humor and anything requiring imagination and a touch of craziness…. Moon in Virgo between Saturday 6/8 at 2:45 PM and Monday 6/10 at 5:28 PM: Excellent for starting a new fitness program, learning, healthy nutrition, fasting, clearing our closets, cleaning our home, reorganizing our drawers…. Perfect also for detailed work, the focused use of our intelligence, and taking care of small pets…. Moon in Libra between Monday 6/10 at 5:29 PM and Wednesday 6/12 at 9:01 PM: Great for relationships, associations, diplomatic exchanges with others, anything related to beauty (a haircut, buying new clothes, a make-over…), art (especially painting and decorating…), a pleasant social event (concert, art exhibition…). Moon in Scorpio between Wednesday 6/12 at 9:02 PM and Saturday 6/15 at 2:02 AM: Perfect for scientific research, esoteric studies, self-transformation, shamanism, dealing with the mysteries of life, death, and sexuality, as well as insurances and issues involving personal power. Moon in Sagittarius between Saturday 6/15 at 2:03 AM and Monday 6/17 at 9:12 AM: Perfect for traveling, religious and/or philosophical activities or matters related to higher education and the law. Excellent for lecturing, learning, perfecting a foreign language, exploring other cultures… Perfect also for athletic training and tending to large animals (horses….). Moon in Aquarius between Wednesday 6/19 at 7:01 PM and Saturday 6/22 at 7:00 AM: Perfect for philanthropic activities, charitable organizations, meeting with friends, making new acquaintances. Good also for inventions, far out, progressive ideas, inter-dimensional and time travel, anything related to UFOs, computers and technology in general…. Moon in Aries between Monday 6/24 at 7:38 PM and Thursday 6/27 at 6:31 AM: Perfect for intense physical activities, anything requiring forceful, direct action and self-assertion. Good also for leadership, spontaneity, good will, being a way shower, initiating new projects or bringing our car to the mechanic…. This month’s intentional meditation started on Saturday 5/18, when we took out as many blank sheets of paper as we would have intentions and placed them near a window, on a balcony or in a garden so that they would bask in the light of the Full Moon in Scorpio. Once that moment had passed, we gathered our Full Moon charged blank sheets and placed them in a folder. Next month’s intentional meditation, begins on Monday 6/17. Take out as many blank sheets of papers as you will have. intentions and place them near a window, on a balcony, or in a garden so that they bask in the light of the Full Moon in Sagittarius at exactly 1:31 AM. Once that moment has passed, gather your Full Moon charged blank sheets and place them in a folder. A wonderful day for a passionate date. A relationship begun today feels predestined, going much deeper than a mere physical attraction. A feeling of past life recognition permeates that encounter and we could become fascinated by that person. In an existing romantic involvement we become aware of our dilemmas or blocks to intimacy. Our charisma is greatly enhanced today. Inasmuch as we listen to our intuition, a financial deal is particularly conducive to acquiring wealth and power. During these next 3 weeks, communications are more subjective than objective. We could feel more than we think and tend to take comments more personally than we usually do. We are concerned with family, food and safety. Our imagination is triggered. Excellent for designers and visual artists. A day to enjoy caring exchanges with children and animals. Communications and social encounters are lively, varied and exciting. Our curiosity is triggered by unusual people walking to the sound of their own drummer. New intellectual horizons open before us. Attention to details may not be our forte today as we may be too excited or scattered to focus on little things. During the next 3 weeks, our social life should become lighter and more varied. We could seek, or be invited to, fun gatherings exposing us to people who expand our intellectual horizons. A romantic attraction could be exciting but short lived for lack of true commitment. Money comes and goes. We could feel vaguely anxious today for no logical reason. A situation or a person could leave us uneasy without us really being able to pinpoint why. We could feel drained by circumstances and unusually confused as to what next step to take. Best to lay low today and avoid contacts with characters prone to deception. A wonderful day to congratulate ourselves for our achievements and keep expanding our dreams. Our success is measured by our integrity and our self-worth. We could be invited to an elegant gathering. If we can, best to delay an important expense as it may today be a lot more costly than it is worth. A day of reverie and becoming fascinated by artists or inspiring spiritual people who trigger our imagination and enrich our consciousness. We could be particularly susceptible to alcohol and drugs. Best to keep those under control. Wonderful for an idyllic vacation in a dream location that enhances our appreciation for beauty and helps us unwind in magical ways. While something we really wanted may come to pass, we could feel pessimistic and somewhat depressed. Oscillating between our visions and a grey reality can take its toll. Financial matters could be disappointing. Someone in our life is likely to be deceptive. We could feel anxious without quite understanding why. Important to stay realistic without losing sight of our dreams. A day to strike a positive balance between our dreams and reality, thus manifesting our visions in concrete reality. A stable condition in our lives could be dissolving. Allowing it to disappear without us resisting, helps us find within the rubbles the seeds of a new becoming. Our exchanges with others are particularly direct today. We courageously call a spade a spade and leave no uncertainty as to what our intentions are. We should however beware when driving, as impulsive reactions could cause harm. Best to compromise today, keep our opinions to ourselves and meet others mid-way. Being too forceful in our communications could create sharp animosities. We may feel pushed to make important changes leading to new beginnings. A cycle ends while another starts that bring us closer to our objectives. Regarding Neptune retrograde, kindly refer to the opening paragraph. During the next month, our sensitivity is heightened. Artistically inclined individuals are drawn to cooking, drawing and painting. Decorating our house, making our home comfortable, nurturing and safe becomes a priority. Taking care of children and creating harmonious family relationships occupies much of our energy. A wonderful time to pamper ourselves and cherish those we love. A relationship which seems too good to be true, could indeed be just that. A person we are intimately involved with could prove untrustworthy and deceptive, confused and confusing. Delusions of grandeur could mar money matters and make us believe in pipe dreams. We need to beware of people promising great financial benefits that are nothing but scams aimed at depleting us of our resources. During the next 3 weeks, our way of thinking and talking is more dramatic. We could be attracted to the limelight as well as to creative art forms enabling us to express our uniqueness. Our generosity of spirit shines great light and warmth upon those we encounter. A day to expect the unexpected. Plans could be wrecked. Unusual circumstances could occur. Exciting people could cross our path offering opportunities we had never thought of. The more flexible and present to each moment we are, the greater the benefits of this exciting and freeing day. Wishing you an amazing month of June!